200HT0200 2 6 1.40 .70 .60 34 200 26"
200HT0250 2-1/2 6 1.40 .70 .60 27 200 26"
200TH0300 3 6 1.40 .70 .60 23 200 26"
200TH0400 4 6 1.40 .70 .60 18 200 26"
200TH0500 5 6 1.40 .70 .60 15.2 190 26"
200TH0600 6 .6 1.40 .70 .60 12.8 190 26"
200TH0800 8 6 1.40 .70 .60 9.7 190 26"
200TH1000 10 8 1.60 .80 .80 9.1 190 26"
200TH1200 12 8 1.60 .80 .80 7.6 190 26"
200TH1400 14 8 1.60 .80 .80 6.5 130 26"
200TH1600 16 8 1.60 .80 .80 5.7 115 26"
200TH1800 18 8 1.60 .80 .80 5.1 115 26"
200TH2000 20 8 1.60 .80 .80 5.1 115 26"
200TH2400 24 10 2.00 1.0 1.0 4.3 100 26"
Available in one, two or three arches, the Spool Type joint has flanges integral with the body and employs metal retaining rings. 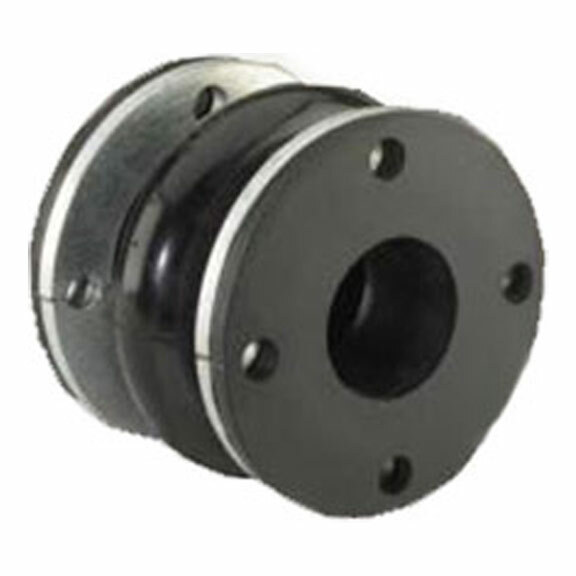 The standard flanges mate with 125/150# flanges. Its body is constructed with high strength fabric. Multiple arches are available to handle greater movements. To prevent the collection of solid materials in the arch, a soft rubber filler can be supplied. Filler reduces normal movement by up to 50%. Custom, non-standard lengths and special flanges are available.